Slavery as it existed in Africa has seldom been portrayed—and never with such texture, detail, and authentic emotion. Inspired by actual 19th-century court records, Unconfessed is a breathtaking literary tour de force. They called her Sila van den Kaap, slave of Jacobus Stephanus Van der Wat of Plettenberg Bay, in the colony of South Africa. They called her murderer, and demanded that she explain her terrible violence. A woman fit for hanging . . . condemned to death on April 30, 1823, only to have her sentence commuted to a lengthy term on the notorious Robben Island. Sila spends her days in the prison quarry, breaking stones for Cape Town’s streets or cleaning the Warden’s house. Her fierce, sometimes tender voice recalls the dramatic events of her life—as well as its small, precious moments and pleasures. 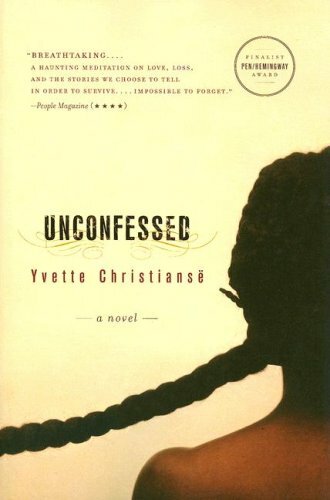 Unconfessed is an epic novel that connects the reader to the unimaginable through the force of poetry and a far-reaching imagination. This fiercely poetic literary debut re-creates the life of an 19th-century slave woman in a gripping tale that captures the epic sweep of history and the intimacy of daily life. Yvette Christiansë was born in <?xml:namespace prefix = st1 ns = "urn:schemas-microsoft-com:office:smarttags" />South Africa under apartheid and emigrated with her family via Swaziland to Australia at the age of eighteen. She is the author of the 1999 poetry collection Castaway. She teaches English and postcolonial studies at Fordham University and lives in New York City. Unconfessed is her first novel. Do you have any mental image of Sila? What kinds of detail emerge from her deeply introspective voice? Why do you think the author chose to shift from third person to first person narrative? What does this shift achieve? How and when does the tone and style of Sila’s language change? Can we trust Sila’s account of everything? Or are there moments when we believe her and moments when we doubt her? What do you think Sila keeps secret, and why? What does Sila say to her friend Lys that she does not say to her son, Baro? Why do you think Sila says nothing about the father or fathers of her children? Does it matter that she says nothing about them? Or are there clues as to who he/they might be? Is Sila’s life ever open to something other than grief and rage? What kind of humor does Sila have? How does the novel dramatize what is happening at this moment in South Africa’s early history? What are the differences and conflicts between the English and the Dutch that filter through Sila’s story? Do you perceive any differences between what you know of slavery in, say, the Americas, and the world that unfolds in Sila’s story? Why would we be interested in yet another slave story? What does this book have to say that is different?